A "LIMS" community for Robert Pattinson. If you love Robert Pattinson, expect fun challenges with high quality pictures, a timely schedule, and a overly dedicated Mod, then this is the place for you. rpattlims is a LIMS competition community. Basically, each week I'll post a new challenge for the participants, until we have only one participant left. This will give us our Last Icon Maker Standing; aka "LIMS". To join in on the challenges, just sign up here. Even if you can't make icons, but still love Robert Pattinson, you may vote. A voter's voice is what decides the winners in the end. Thanks for stopping by & I hope to see you involved. 01: Participants may only enter 1 icon per challenge, unless stated otherwise. 02: Icon entries must fit Live Journal Standards. 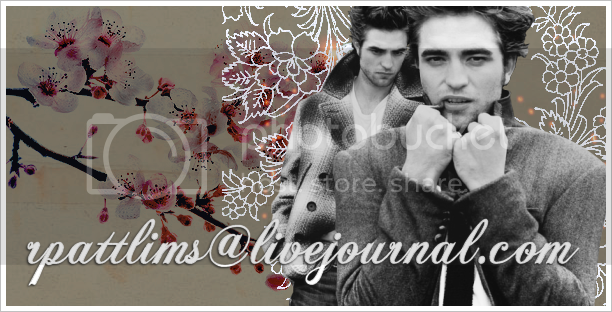 03: All entries must have Robert Pattinson in the icon, but this is not limited to just Robert Pattinson. 04: Only use the pictures provided, unless stated otherwise. 05: Animations, brushes, textures, etc are allowed and highly encouraged. 06: All entries must be made for the specific challenge. 07: Participants must keep their icons anonymous until after voting. 08: When submitting an icon, please add the image of the icon and a direct url. Photobucket, Image Shack, and Tinypic are all great hosting sites. 09: If you ever need to use a skip, just leave a comment on the challenge your skipping. 01: Please use the provided form. This helps keep the votes organized. 02: Participants are not allowed to vote for themselves or have others do so. 03: Reasons are not required to cast a vote. 04: Votes are weighted, so you must vote in order. We will be voting off the worst icon(s)each week. When voting please use the provided form. Icon #15 will receive -3 points, icon #07 will receive -2 points, and icon #20 will receive -1 point. Icon #02 will receive +3 points. I'll then add your - points and + points together. The contestant with the most - points will be eliminated and the contestant with the most + points will win Community's Choice. If you have any concerns, ideas, suggestions, or anything else leave a comment here. If you want to become an affiliate, just comment here.